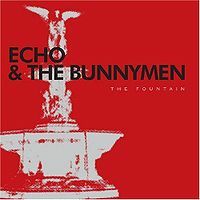 In a press release, Echo and the Bunnymen singer Ian McCulloch said that the band’s latest album, The Fountain, is their best work since Ocean Rain. Regardless of whether you agree or not with that pronouncement, The Fountain is an electrifying and vibrant work that is on a par with the Bunnymen’s finest stuff from the ‘80s. it’s hard not to get caught up with some of the album’s rocking tracks like “Think I Need It To,” “Everlasting Neverendless” and “Do You Know Who I Am”; “Life of a Thousand Crimes” is a perhaps uncharacteristic track showing the band’s funky swing side, while “The Idolness of Gods” is a very soulful ballad that closes the album. The group sounds revitalized on The Fountain, and McCulloch still possesses that distinct vocal charisma.